They say necessity is the mother of invention, and that appears to be what motivated Ukranian state-owned defence contractor, Ukroboronprom to develop the “Phantom” tactical unmanned multipurpose vehicle. Describing the Phantom as a “new armament type,” Ukroboronprom says it can carry out tasks that are now performed by soldiers. In modern arms production, the focus is on developing unmanned weapons that aim to protect the most valuable asset—a soldier’s life, says Ukroboronprom. The Phantom can provide cover fire for ground forces, conduct reconnaissance, checkpoints and border control; transport ammunition; retrieve wounded from the battlefield, serve as a power source; and participate in demining operations. It can also be used together with unmanned aircraft. At IDEX in Abu Dhabi in February, Ukroboronprom presented a new modification of the Phantom fitted with the “Barrier" anti-tank missile system. The Barrier allows the Phantom to hit heavily and lightly armoured targets at a distance of 100 m to 5,000 m. Ukroboronprom says Phantom firing trials—held with the installed 12.7 mm machine gun—confirmed high efficiency of the new development. The Phantom can be equipped with a stabilised turntable platform for different types of weapons. If it is equipped with an anti-missile system; the army receives nearly invisible, mobile and effective means of enemy armoured vehicles’ destruction, said the head of SpetsTehnoEksport, a state-run Ukrainian entity focused on export-import armament activities, Pavlo Barbul. "This equipment can deliver ammunition and loads across the areas that are under the threat of enemy fire, or at risk of mining, to safely and quickly evacuate wounded from the battlefield," he added. A hybrid engine with all-wheel drive, independent suspension and hydraulic braking system ensures high performance when driving in sand. Communication between the control centre and the Phantom are provided by means of secure radio channel with an action radius of up to 10 km or via fibre cable up to 5 km in length. In light of Russian-backed rebel incursions into eastern Ukraine and Crimea, Ukraine has enlarged its armed forces and is undertaking a modernisation process to bring it in line with NATO standards, says the International Institute for Strategic Studies in its 2017 The Military Balance publication. According to some reports, Ukraine is set to increase military spending b $3 billion by 2017. Increased expenditure by the Ukranian government comes at a time when Russia looks set to decrese its defence expenditure as a result of the economic recession brought on by western sanctions and falling commodities prices. Fighting still continues in eastern Ukraine between Ukranian government forces and Russian-baced separtists, with most of the heavy fighting taking place in the Donbass region and Avdiivka. Two major cities in the east, Donetsk and Luhansk remain under rebel control. Some have described the conflict in eastern Ukraine, which was sparked by Russia's annexation of Crimea in 2014, as "Europe's forgotten war." Some estimates put the number of Ukranian soldiers and civlians killed in the conflict at 50,000. Against the Russian-backed separatist forces, the Ukranian Army has been using Soviet-era tanks, shoulder-launched anti-tank rockets and Soviet-style anti-tank missiles. Ukroboronprom is reported to be speeding up production of modern, light armoured vehicles. Eighty BTR-4E vehicles were used to help strengthen the Ukranian Army in military operations in the east of the country. Ukroboronprom is not the only manufacturer that is developing armed unmanned ground vehicles (UGVs). At the 2015 DSEI exhibition in London, Estonian company Milrem presented the THeMIS (Tracked Hybrid Modular Infantry System). 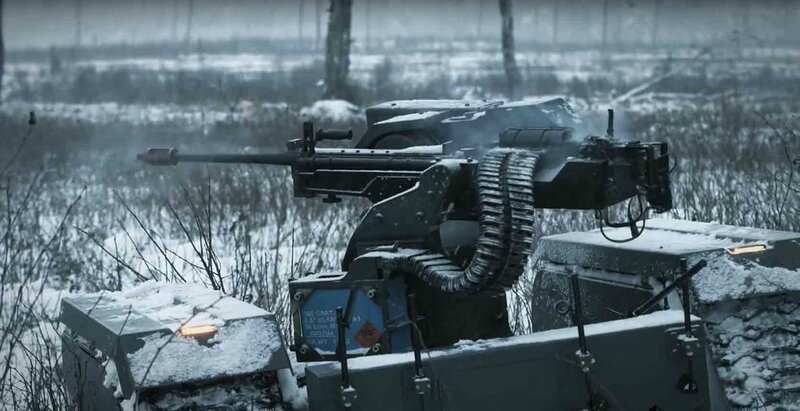 Estonian Defence Forces successfully tested the THEMIS fitted with ST Kinetics’ ADDER remote weapon station. Russia has also launched an unmanned combat ground vehicle, the Vikhr equipped with a stabilised 30 mm Shipunov 2A72 automatic cannon, a coaxial 7.62 mm Kalashnikov PKT/PKTM, and six ready-to-launch AT-14 Spriggan anti-tank guided missiles. Other artillery systems can be integrated onto the platform. 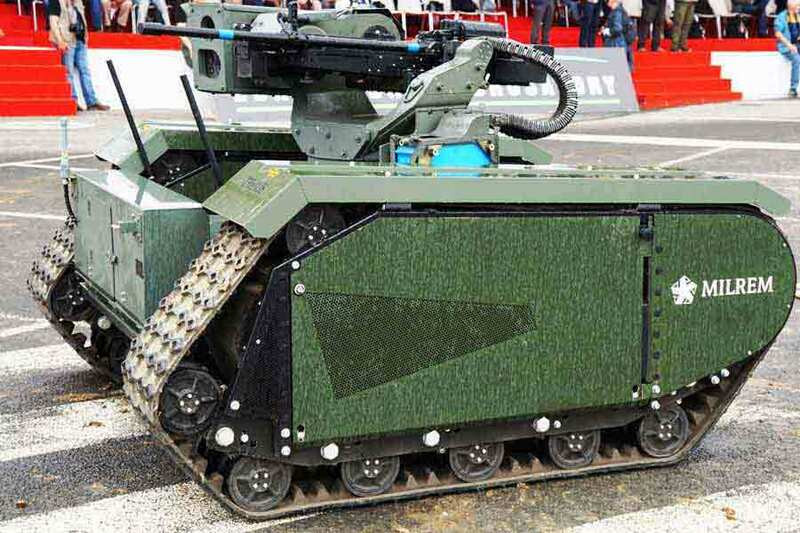 Other tactical, combat UGVs include Leonardo-Finmeccanica’s TRP2 Combat, which features a light machine gun and grenade launcher. The new era of combat UGVs is likely to be combat reconnaissance on the battlefield and fire support. As far as they will be able to replace manned assets and troops, UGVs are and will be increasingly recognised as relevant force multipliers, says Giulia Tilenni, a junior analyst in defence and security affairs and editorial coordinator of the European affairs desk at online journal, Il Caffè Geopolitico. "To have fully autonomous systems in the battlefield has the potential to end in a total substitution of soldiers for whole missions, as the UGV will not need an operator, and will perform pre-planned tasks autonomously,” says Tilenni. “This will further reduce risks for personnel involved in the missions. However, using UGVs in this way could mean it is difficult to suddenly reshape an ongoing operation to follow eventual environmental changes, for example, a mistaken target identification.